Each mL of PATANOL contains: Active: 1.11 mg olopatadine hydrochloride equivalent to 1 mg olopatadine. Preservative: benzalkonium chloride 0.01%. Inactives: dibasic sodium phosphate; sodium chloride; hydrochloric acid/sodium hydroxide (adjust pH); and purified water. It has a pH of approximately 7 and an osmolality of approximately 300 mOsm/kg. Olopatadine is an inhibitor of the release of histamine from the mast cell and a relatively selective histamine H1-antagonist that inhibits the in vivo and in vitro type 1 immediate hypersensitivity reaction including inhibition of histamine induced effects on human conjunctival epithelial cells. 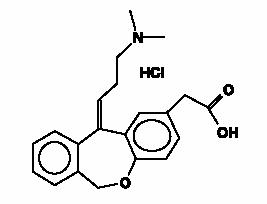 Olopatadine is devoid of effects on alpha-adrenergic, dopamine, and muscarinic type 1 and 2 receptors. Following topical ocular administration in man, olopatadine was shown to have low systemic exposure. Two studies in normal volunteers (totaling 24 subjects) dosed bilaterally with olopatadine 0.15% ophthalmic solution once every 12 hours for 2 weeks demonstrated plasma concentrations to be generally below the quantitation limit of the assay (<0.5 ng/mL). Samples in which olopatadine was quantifiable were typically found within 2 hours of dosing and ranged from 0.5 to 1.3 ng/mL. The half-life in plasma was approximately 3 hours, and elimination was predominantly through renal excretion. Approximately 60-70% of the dose was recovered in the urine as parent drug. Two metabolites, the mono-desmethyl and the N-oxide, were detected at low concentrations in the urine. Results from an environmental study demonstrated that PATANOL was effective in the treatment of the signs and symptoms of allergic conjunctivitis when dosed twice daily for up to 6 weeks. Results from conjunctival antigen challenge studies demonstrated that PATANOL, when subjects were challenged with antigen both initially and up to 8 hours after dosing, was significantly more effective than its vehicle in preventing ocular itching associated with allergic conjunctivitis. PATANOL (olopatadine hydrochloride ophthalmic solution) 0.1% is indicated for the treatment of the signs and symptoms of allergic conjunctivitis. PATANOL (olopatadine hydrochloride ophthalmic solution) 0.1% is contraindicated in persons with a known hypersensitivity to olopatadine hydrochloride or any components of PATANOL. PATANOL (olopatadine hydrochloride ophthalmic solution) 0.1% is for topical use only and not for injection or oral use. To prevent contaminating the dropper tip and solution, care should be taken not to touch the eyelids or surrounding areas with the dropper tip of the bottle. Keep bottle tightly closed when not in use. Patients should be advised not to wear a contact lens if their eye is red. PATANOL® should not be used to treat contact lens-related irritation. The preservative in PATANOL, benzalkonium chloride, may be absorbed by soft contact lenses. Patients who wear soft contact lenses and whose eyes are not red should be instructed to wait at least ten minutes after instilling PATANOL (olopatadine hydrochloride ophthalmic solution) 0.1% before they insert their contact lenses. Olopatadine administered orally was not carcinogenic in mice and rats in doses up to 500mg/kg/day and 200mg/kg/day, respectively. Based on a 40 µl drop size, these doses were 78,125 and 31,250 times higher than the maximum recommended ocular human dose (MROHD). No mutagenic potential was observed when olopatadine was tested in an in vitro bacterial reverse mutation (Ames) test, an in vitro mammalian chromosome aberration assay or an in vivo mouse micronucleus test. Olopatadine administered to male and female rats at oral doses of 62,500 times MROHD level resulted in a slight decrease in the fertility index and reduced implantation rate; no effects on reproductive function were observed at doses of 7,800 times the maximum recommended ocular human use level. Pregnancy Category C. Olopatadine was found not to be teratogenic in rats and rabbits. However, rats treated at 600 mg/kg/day, or 93,750 times the MROHD and rabbits treated at 400 mg/kg/day, or 62,500 times the MROHD, during organogenesis showed a decrease in live fetuses. There are, however, no adequate and well-controlled studies in pregnant women. Because animal studies are not always predictive of human responses, this drug should be used in pregnant women only if the potential benefit to the mother justifies the potential risk to the embryo or fetus. Olopatadine has been identified in the milk of nursing rats following oral administration. It is not known whether topical ocular administration could result in sufficient systemic absorption to produce detectable quantities in the human breast milk. Nevertheless, caution should be exercised when PATANOL (olopatadine hydrochloride ophthalmic solution) 0.1% is administered to a nursing mother. Headaches have been reported at an incidence of 7%. The following adverse experiences have been reported in less than 5% of patients: asthenia, blurred vision, burning or stinging, cold syndrome, dry eye, foreign body sensation, hyperemia, hypersensitivity, keratitis, lid edema, nausea, pharyngitis, pruritus, rhinitis, sinusitis, and taste perversion. Some of these events were similar to the underlying disease being studied. The recommended dose is one drop in each affected eye two times per day at an interval of 6 to 8 hours. 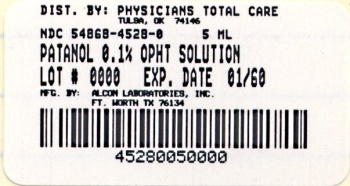 PATANOL (olopatadine hydrochloride ophthalmic solution) 0.1% is supplied as follows: 5 mL in plastic DROP-TAINER® dispenser. U.S. Patent Nos. 4,871,865; 4,923,892; 5,116,863; 5,641,805. © 2000, 2003, 2005 Alcon, Inc.